For a companion video to this topic, see Parallels: Using Visual Studio on OSX. A Windows 8 bootable DVD or USB drive that contains Windows 8.1. To get it, go to this page on the Windows Dev Center. Note If you plan to develop apps for Windows Phone, you must install a 64-bit (x64) version of Windows 8.1, otherwise, a 32-bit (x86) or 64-bit version of Windows 8.1 is fine. Run the Parallels Desktop .dmg package that you downloaded earlier. When the Parallels Desktop app starts, double-click the Install icon, as shown in the following figure. In the Software License Agreement page, click Accept. If you're prompted to authenticate with your Mac OS X account for one-time initialization, type your Mac user name and password, and click OK. When the installation is done, the Activate Parallels Desktop page appears. In the Request Trial Key page, type your user name and email address, click your country in the Country list, and click Get Trial. This activates Parallels Desktop. 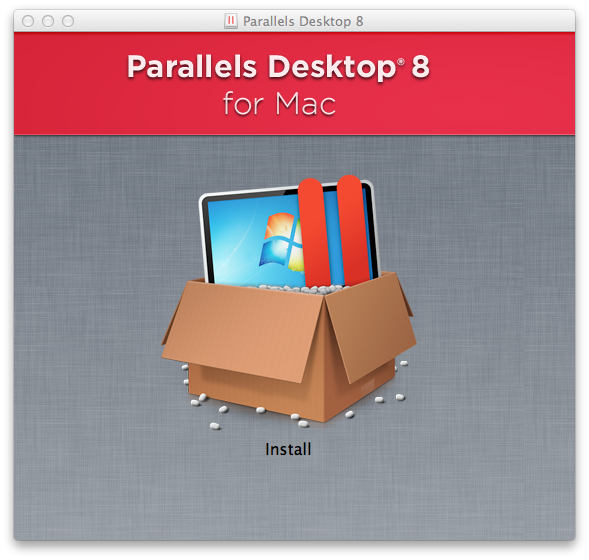 After you've activated Parallels Desktop, the New Virtual Machine page appears. In the New Virtual Machine page, click the Install Windows or another OS from DVD or image file icon as shown in the following figure, and click Continue. In the New Installation page, in the Install from list, click Choose an image file, and browse to and select the Windows 8.1 disk image (.iso) file that you created earlier. Then click Continue. If you have a Windows 8.1 bootable DVD, instead of clicking Choose an image file, click the DVD drive that contains your Windows 8.1 bootable DVD, as shown in the following figure. Then click Continue. In the Windows Product Key page, uncheck the Express installation box. (Don't enter the product key in the Product Key box. You'll enter a product key after you start installing Windows 8.1.) Then click Continue, as shown in the following figure. In the Integration with Mac page, click either the Like a Mac or Like a PC icon (if you're not sure which icon to click, click Help me choose), and click Continue. In the Name and Location page, in the Name box, type a name for the virtual machine (like "Windows 8"). In the Location box, click where the virtual machine will be stored. Then, with the Customize settings before installation box checked, click Continue. The virtual machine settings page appears. With General selected, confirm the virtual machine name, and set the number of CPUs and memory that the virtual machine will use (use at least 2 virtual CPUs and 2 GB (2048 MB) of memory; using 4 GB (4096 MB) is optimal). Note The Windows Phone 8.1 Emulators in the Windows Phone 8.1 SDK are configured with two cores and therefore the emulators expect to have two cores assigned to them. Please make at least two CPUs available to your virtual machine. We recommend that you allocate at least 4 GB of memory if you plan on using the Windows Phone 8.1 Emulator. If you plan to develop apps for Windows Phone and you need emulator support, enable nested virtualization. If you're developing apps only for Windows 8.1, don't enable nested virtualization, as it noticeably decreases performance. To enable nested virtualization, click Options, and click Optimization. Next to Nested Virtualization, check the Enable box. When the Enabling nested virtualization... dialog box appears, click Yes. When you're done with virtual machine settings, close the settings page. The Virtual Machine Configuration page appears. After you click Continue from the previous step, your virtual machine starts installing Windows 8.1 automatically. 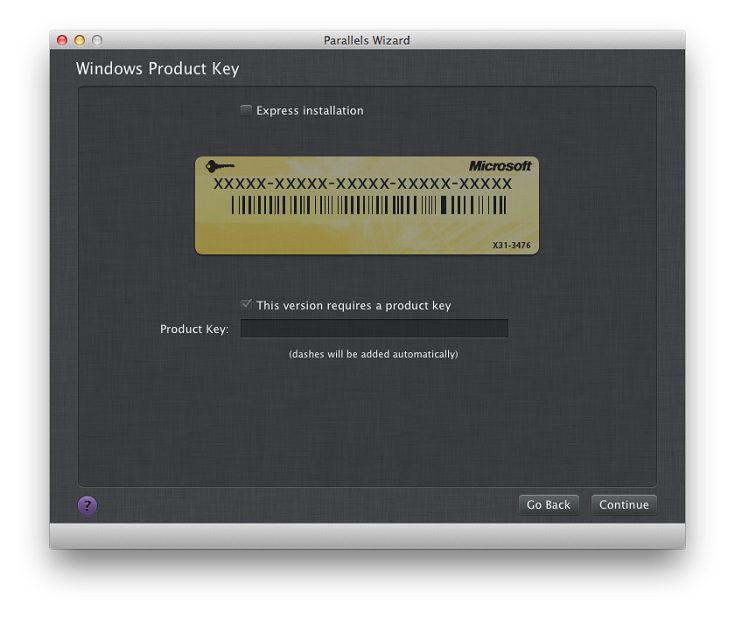 As part of the install process, you'll be asked to enter the product key. Once you have successfully installed Windows 8.1, you will then need to install one of its optional features, Hyper-V. Hyper-V is required by the Windows Phone 8.1 Emulator, and must be installed before the phone SDK. In order to install Hyper-v, open the Control Panel. Select Turn Windows features on or off and enable Hyper-V in the list. Note A restart will be required in order to complete the installation of Hyper-V . If Windows 8.1 isn't already running, launch Parallels Desktop, and start your Windows 8.1 virtual machine by clicking Click to Start with your newly-created virtual machine already selected. 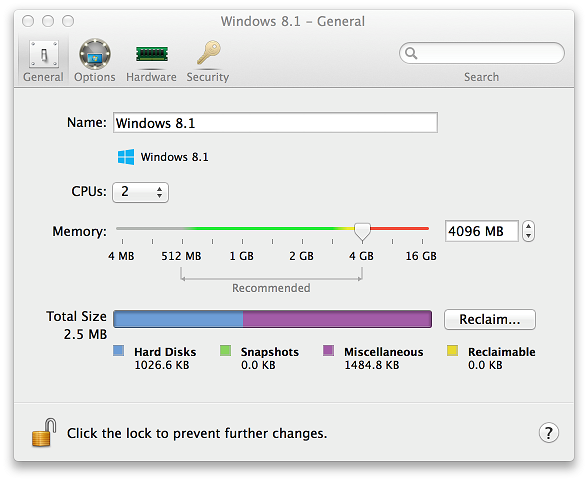 If the Apple Parallels Desktop menu isn't visible, click near the top of the virtual machine window to display it. 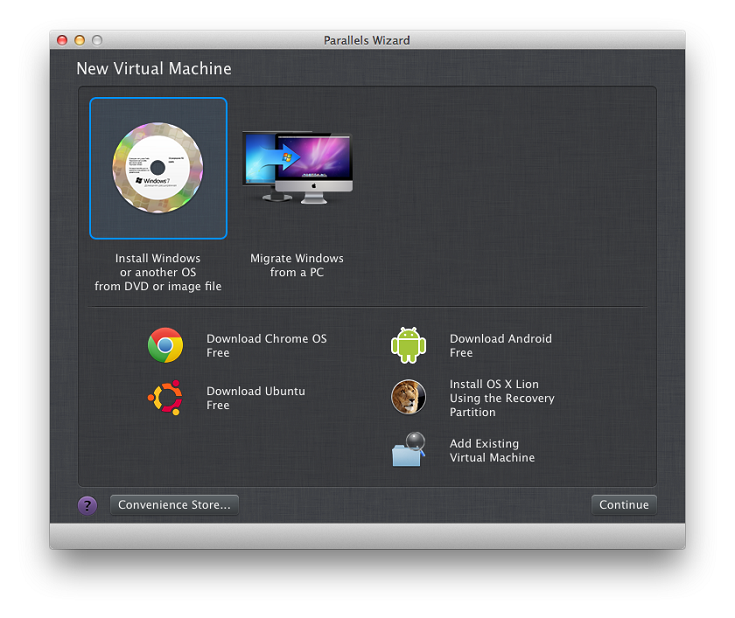 Click the Virtual Machine menu, and click Install Parallels Tools. You see a notification about connecting the Parallels Tools installation media to the virtual machine and starting the installation. Click Continue. 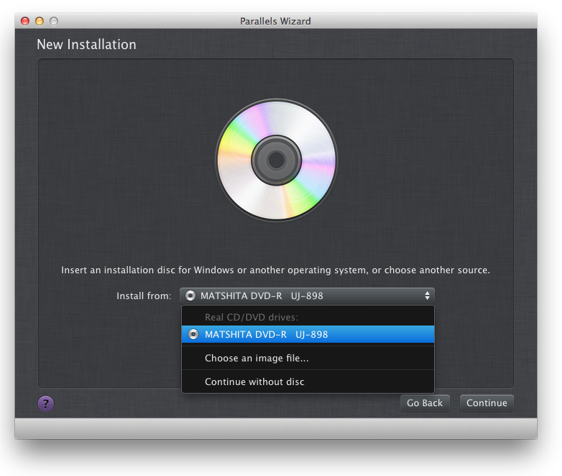 In the dialog box that appears, click Install Parallels Tools. If prompted about making changes to the computer, click Yes. This starts installing Parallels Tools. After Parallels Tools installs, click Restart (or simply wait a few minutes) to restart the virtual machine.